Let me ask you something unusual? How good is your imagination? How well can you imagine things? Can you imagine seeing, hearing, smelling, tasting, feeling things when you close your eyes? What about biting a fresh lemon? What about smelling your favourite flowers? What about feeling warm summer breeze in your face? What about hearing voices of your loves ones and seeing their faces? Most people daydreaming, when they imagine things they desire, things they hope for. Sometimes people spend a lot of time imagining fulfilment of their dreams, imagining that if only their dreams came true they would be happy and blessed, and joyful and content, etc. All would be so good, peace and joy and security. We as Christians also need good imagination. This is true that we learn and explore basics of our Christian faith by reason. We search for the truth by our reason. Reason is very important for us Christians. Our understanding about this world, about God and about ourselves is built on knowledge about historical events, about God’s own actions in our world, on what God did before the eyes of hundreds and thousands of eyewitnesses. All of this we evaluate and comprehend by our reason. But this is not all. We need also imagination. The most famous Christian writer of 20th century C. S. Lewis was self-professed atheist before he became a Christian. When he was exploring God’s activities in history and Christ’s message to us, his reason told him that this must be true. All evidence told that this must be true. However, Lewis still hesitated to embrace Christ’s message. His good friend and colleague was John Tolkien, the author of famous trilogy “The Lord of the Rings”. It was Tolkien who said to Lewis that his problem with Christ’s message was not related to his reason, but to his imagination. The point was that Lewis couldn’t rejoice in Christ message, because the lack of imagination didn’t allow him to grasp the full beauty of the Gospel. Imagination! And once the Holy Spirit turned on Lewis imagination, the riches of God’s message were open to him. We all need to pray the Holy Spirit to activate our imagination if we want to grasp the riches of God’s promises that are given to us in His word. It is our imagination that can help us to grasp the greatness of God’s reality that is revealed to us in His words. Understand this – we as Christians are invited to imagine not something that is not real, but to imagine what is. We are invited to imagine how things truly are, to imagine God’s reality in our lives, and the transformation worked by the word of God. We don’t need to waste our imagination daydreaming about something that may not be true, if we can imagine much greater things which actually are true. Let us look at our today’s text and see how our imagination can help us to rejoice in God’s message to us. Such beautiful promises. Why was it so difficult for Jesus listeners to receive these promises? “I am the living bread that came down from heaven.” Imagine that you are among Jesus’ listeners – whom do you see standing before you? Jesus from Nazareth, a poor carpenter from Galilee. 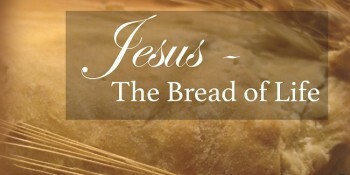 How can He say that He is the living bread that came down from heaven? We know His family! How can He say that whoever eats Him and drinks Him will have eternal life? Still, this is not something we can easily comprehend. Already since the first centuries the Church has used the image of red-hot burning iron to help us to imagine the unity of man and God in Jesus Christ. Iron is iron with characteristics of iron. But when iron is heated up red-hot it joins with fire, and it has also characteristics of fire. It glows, it burns, even if it is still iron. And, on other hand, fire joined with iron can do what it can’t alone. For example, it can burn a mark, you can’t do this with fire alone. In Jesus Christ two natures came together as well. Divine and human. God and man. Jesus was true man, but He was also true God. His flesh was flesh of man, but at the same time, flesh of God. To receive the man Jesus is to receive holy God Himself, to receive the very source of life. The point that Jesus is making is that we can’t receive God in any other way. We can’t receive eternal life in any other way. Only in Jesus Christ. It doesn’t help at all saying that God is everywhere. Sure He is, for He is the Creator. But He has revealed Himself in this very particular way. In this man Jesus Christ. So that He could converse with us, so that we could learn about His attitude towards us, so that we could have access to Him. So that we could receive Him. We can’t receive eternal life in any other way. Not by anything that we do, not by our lives, not by who we are, not by what we believe, but only in Him, when our souls eat this living bread from heaven. Jesus makes it so clear that we can have eternal life only in Him, and He offers it to us as a free gift. Addressing people in Capernaum Jesus compared believing in Him to eating and drinking. It is a very powerful, very deep image. Think about food! Food has such a crucial role in our lives. Especially in Barossa. The first words which God said to Adam were about food. “You may surely eat of every tree of the garden…” (Gen 2:16) Eating and drinking are such profound activities. Life sustaining activities. When we have in the Bible images of eternal life, of God’s Kingdom, these are images of eternal feast, of eating and drinking. This is how the great prophet Isaiah describes the age to come. And now Jesus compared faith in Him, trust in Him to eating and drinking. As important as eating and drinking is for this life, the eating and drinking of Christ in faith is for our eternal life. God’s presence is the source of life. And for the humanity God’s presence is given nowhere else, but in Christ Jesus. Only in Him true God is present among us. Only in Him holy God offers us eternal life. Only one who receives God in Jesus Christ will live forever. Remember, all of this is said for you. All of this is given to you. Now, use your imagination! Imagine what truly is. Imagine what is truly happening right now and right here. Imagine what God truly does for you! Jesus Christ speaks to you through your pastor. It is God Himself who uses imperfect human language, and imperfect human being to speak to you His life giving words; to proclaim His forgiveness, and to affirm His love to you. Imagine, God the Creator is feeding your right now. He is speaking to you right now. He is calling you, He is inviting you, He is giving you His life-giving Holy Spirit. We need to use our imagination to picture the beauty of what God does for us. Right now! We don’t need to imagine something that is not true. We don’t need to waste our imagination for empty dreams, that don’t deliver. We are invited to use our imagination to grasp the miraculous and wonderful reality that God works in our lives right now. Yes, He speaks to you and as He speaks the Holy Spirit comes to you. But there is more. The day before Jesus was crucified He gave His Church a gift – the Holy Communion, the Lord’s Supper, the Eucharist. Jesus gave this gift to us and promised that by eating and drinking bread and wine in the Lord’s Supper, we will be united with Him bodily. That we will receive His true body and blood for the forgiveness of all our sins and for eternal life. Imagine what Jesus gives you! He Himself is present. True God, and true man. Your God and your Saviour. The One who loves you more than anybody else. He gives you His divine body, the very source of life is given to you. Use your imagination to embrace what truly is happening! Imagine angels and archangels singing as you join Christ’s feast. “Holy, Holy, Holy!” Imagine how you receive Christ’s body and blood together with millions and millions of God’s children in this grand feast. Imagine that this feast will continue in God’s Kingdom after Christ’s return in glory. This is the greatest and the most magnificent think that is happening, and you are a part of it! We just need the Holy Spirit to activate our imagination so that we can see God’s reality as it is. I’ll ask you again – how is your imagination? Can you imagine all of this? If not, ask, and it will be given to you! If yes, enjoy, rejoice and be grateful! Amen.